I arrived in Córdoba, the great Almoravid capital of Al-Andalus, or what we now call Spain. The mazy streets, white-washed houses, and groves of orange trees are steeped in a rich history of power and upheaval. While much of Europe was entrenched in an ongoing state of unrest after the fall of Rome, Córdoba emerged as one of the most populous and cosmopolitan cities in the world by the year 1000. 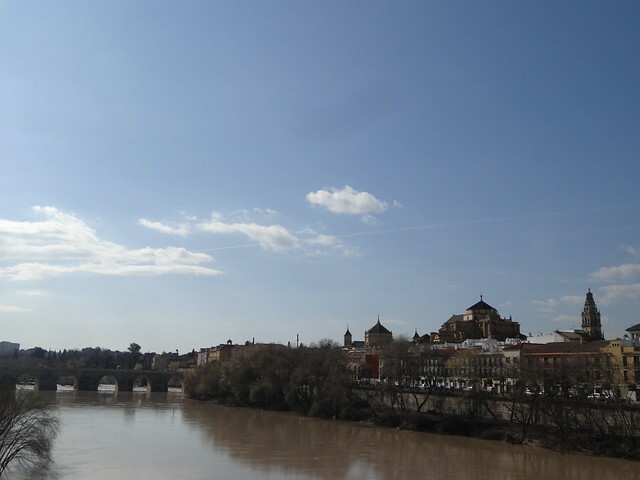 The old city is situated on one side of the Guadalquivir river, and a Roman bridge still connects one bank to the other. Looming above Córdoba is the Great Mosque, and when I had set my things down in my traditional Andalucian hostel I made the short walk up a few cobblestone streets until I emerged in front of the mosque. The outside of the mosque is covered with beautiful looping geometric patterns known as Arabesques (perhaps not the most original name, but there you have it). As the city grew and peace came to Andalucia, the mosque grew with it, and it was built in four stages over the course of two hundred years. Before entering the mosque, one enters the Patio of Oranges, a massive open-air pavilion that is filled with citrus trees, cypresses, and palms. It is remarkable to consider that there have been oranges growing in this spot for over a thousand years, and that this place has always remained a miniature Eden despite changing rulers. As idyllic as the exterior space is, the interior steals the show. Particularly because of my previous visits to Christian churches, visiting the Great Mosque at Córdoba offered me a striking contrast in styles which I savored. 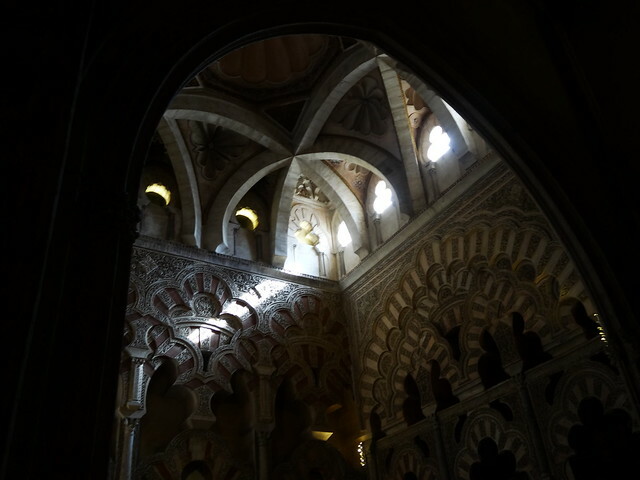 What is most apparent to me at Córdoba as opposed to Chartres, Auxerre, or Metz is the relationship between the visitor and the interior space. At Córdoba, the floor plan is vast and extensive–its footprint is staggeringly huge, much more so than Amiens, one of the largest Gothic cathedrals built. On the other hand, its height is inversely related to its width, and it is here that I find the differences in building style to be a brilliant reflection of the worship style of each religion. For Muslims, prayer happens facing the ground, with the body parallel to the floor; for Christians during this period–when churches were stood in because there were no pews to be sat upon–the experience of prayer happened vertically. The master builders of Córdoba recognized that someone praying in the mosque would be most reverent of God’s limitlessness power if it seemed like the legion of arches and columns never ended, and hundreds of years later the architects of the great cathedrals of France would realize this same goal by placing worshipers beneath starry-painted ceilings which soared above their heads. Sorry if you were falling asleep there, the art history portion of this blog post has now concluded. The next day I had nothing in particular to see, so I let me feet carry me through the city. I walked down many tiny streets until I emerged into a large plaza. There were bars just about everywhere and dozens of tables waiting for me to plop into, but I felt like I was close to something truly remarkable so I kept on and exited the square. It was lunchtime and all the kids were out, walking home for the midday meal; my stomach was getting pretty antsy. Hunger can bring about deep reflection, and it can also lead to inspiration. In this case, it led me to one of the most satisfying meals I’ve had in Spain. I started with a dish of delicious garlic-marinated peppers, washed down with a glass of Ribera wine. Since I was feeling especially hungry, I ordered the full plate of meatballs with mushrooms, but by the time I was a third of the way through I was already beginning to wonder if my eyes were bigger than my stomach. Naturally, I forced myself to devour every last bite of the delicious and surprisingly affordable stew. Much to my annoyance, I was nowhere near the hostel and very much in need of a siesta, so I began the walk back home. The street itself was a pleasantly photogenic distraction from my increasingly heavy eyes. After I had walked for about twenty minutes or so I was back in the right neighborhood, but I paused by a tight alleyway with mosaic on it, curious to see what lay on the other side. I emerged into a majestic courtyard that was rimmed with quaint blue ceramic pots and neatly-trimmed shrubs resting in the center. 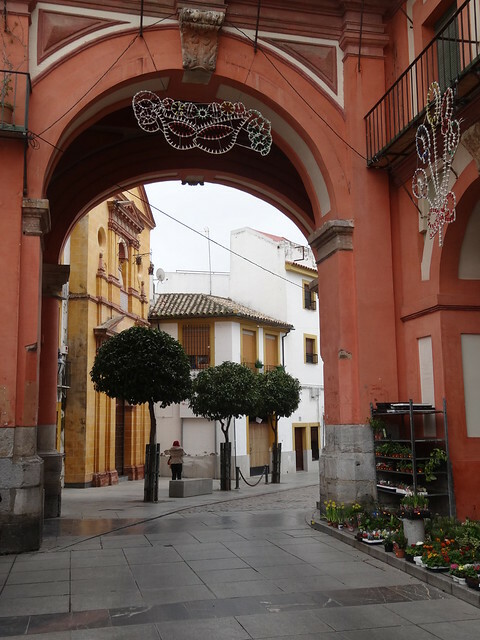 Were it not for the slight cold setting in (Córdoba is located at the foot of the mountains so it can get chilly) I would have sworn I was dreaming. I wasn’t, but this city definitely has a bit of fantasy to it. I must admit I felt a bit sad here–what if the Jews of Spain had never been expelled? Maybe this would have been my home! Most of Córdoba’s glory is constrained to the past, but I know two things which are just as beautiful today as they once were: the ever-present orange trees and the Great Mosque, standard-bearers of enlightenment when most of the West was dark. Posted in Beauty, Food, GothicTagged Al-Andalus, Andalucia, architecture, Cordoba, Golden Age, Gothic, history, Medieval, Mozarabic, nom nom, photography, Spain, tourism, travelBookmark the permalink. It’s such a breathtaking city, isn’t it? Glad you got to see it as well! Wonderful, Nathan. We can’t wait to shoot the mosque here. Fell in love with this city and its history. What is astounding about the mezquita is that it wasn’t destroyed by the Spanish king, as was customary. Instead he decided to build a catholic cathedral-like structure within the mosque, creating this incredible contrast we see today.